Fish in the footsteps of Ernest Hemingway with an expert fly fishing guide trip with Sun Valley Mountain Guides! 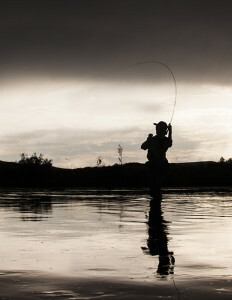 The fly-fishing in the Wood River Valley and surrounding areas is uniquely world-class! The area offers spectacular freestone, spring creek, tail water, and alpine lake opportunities that reward novice and expert anglers alike. Our primary waters include the Big Wood River, Silver Creek, the Salmon River, and the Big Lost River. As extensive and diverse as the waters are, the insect life is equally broad, arguably more interesting, and the reason why so many species of fish survive in our waters. Among the species Sturtevants focuses on are Rainbow Trout, Brown Trout, Brook Trout, Cutthroat Trout, Steelhead, and Kokanee Salmon. Sturtevants is proud to be your complete, one stop fly shop in such an awesome fishing destination. With the best bug selection in the Valley, all your retail and rental needs, complimented by friendly, free advice, and home to the knowledgable fly fishing guides of SVMG Guide Service, we’re ready to assist you in your next fishing adventure. Guests: 1-2 guests per guide for fly fishing trips. Pricing is for up to 2 people, a third person may be added for a modest charge. Children must be 8 years old to accompany a parent on a guided trip. Unaccompanied children must be 12 years of age. What’s Included: Your guided trip includes transportation, your knowledgable fly fishing guide, water and/or other beverages. Lunch is complementary for full day trips and can be added to shorter trips for a nominal charge. You are always welcome to bring a snack. Equipment Rental: Premium waders and boots, and top of the line fly-rods and reels are always available for rent. Fishing trip guests receive a 30% discount off of regular rates on rentals. Guide guests receive a 10% discount on the purchase of rods, reels, waders and boots the day of their trip! Licensed, Bonded and Insured: Sun Valley Mountain Guides operates under special use permits from the following agencies; the United States Bureau of Land Management, Sawtooth National Forest, Salmon-Challis National Forest, and the Idaho Outfitters and Guides Licensing Board. Full day trips visit The Big Lost, Copper Basin, Silver Creek, The Big Wood, Little Wood, other waters, or a combination. Full day trips last 8 hours from store departure. Guide services, transportation, flies, float tubes (if needed), and lunch are included. Two guest per guide limit on Silver Creek. Half day trips are spent on The Big Wood or it's tributaries and are a favorite way to round out a Sun Valley Day. Evenings on The Big Wood are often the best fishing of the day. Usually lasting about 3-4 hours from store departure, guide services, transportation and flies are included. We can easily accommodate (and shuttle!) larger groups - please email us and tell us what you're looking for! SVMG guided trips do not include guide gratuity or Idaho fishing licenses. Idaho resident and non-resident licenses available for purchase at Sturtevants.